Sometimes I know exactly what I want on my nails and I just go for it and in all this I literally have no idea where to start brainstorming what I want on them. Unfortunately this time was the time that I literally didn't know where to start, did I want glitter? did I want colour did I want to be pale? I had no idea. As I have just taken away the pink tones I deafly didn't one pink and I always have a hankering for red but I typically like to be straight up bread and that's not really fun to blog about! I actually did put green on my nails and I like green but what I did with them I really really didn't like if you follow me on Snapchat your now because I showed it on there before I removed it. 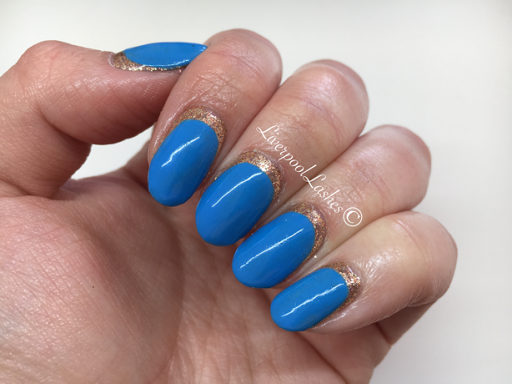 Eventually I finally settled on blue and then I paired it up with gold just add a little contrast. 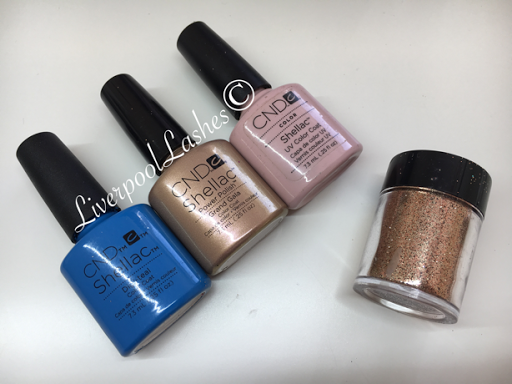 The colours I used were CND Shellac Grand Gala (limited edition but Iced Cappucino would work) with Lecente Glitter in Sleigh Bells (again - limited edition but Sand is a good alternative) with Shellac Clearly Pink over. I then used Shellac Digi-Teal over.